Warwick Bridge Club Grand Masters John Rose and Beverly and Neil Bonnell with the honour board. 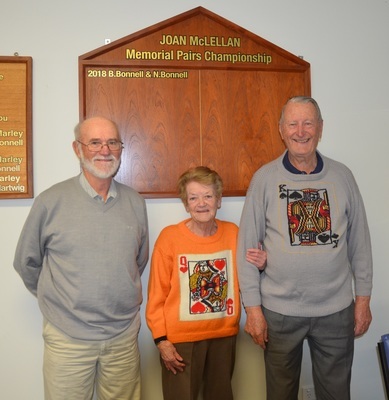 A new honour board at the Warwick Bridge Club honours the late Joan McLellan OAM for her longstanding contributions to the club, including the teaching of Contract Bridge to novice players. The honour board was donated by her niece Priscilla and will record the winners of the Memorial Pairs Championship dedicated in Joan’s honour. The Warwick Bridge Club was formed in 1985 and was inextricably linked to the arrival in Warwick of Neil and Beverly Bonnell. Neil came to town after being appointed Principal of The Scots PGC College – but his taking up of the role was partly conditional on the existence of a bridge club in the Rose City. After discovering that bridge was played somewhat informally in Warwick at the time – with some players travelling to Toowoomba on Friday evenings – the Bonnells and others, including Paul and Mary Johnston, set about establishing a ‘proper’ bridge club in Warwick. Play was originally held at the Band Centre on Albert Street but the big breakthrough for the club came in 2007 when it moved into the former Scout Hut in Victoria Park, following a $90,000 renovation. Today the Warwick Bridge Club has around 60 members, with play held on Mondays and Fridays from 1pm to 5pm. Supervised play and lessons for new and improving players are held on Wednesday’s from 9am to 11.30am. Contract bridge is played by four players per table and requires players to bid how many cards or “tricks” they believe they can take on a deal. Neil Bonnell – the founding president and currently Official Teacher of the Warwick Bridge Club – says one of the many benefits of playing bridge is “keeping the mind active”, along with the “social aspect”. “Our club is a mixture of people who wouldn’t necessarily meet in other circles,” Neil said. New players are always welcome – visit www.warwick.bridgeaustralia.org or contact Neil Bonnell on 4661 8221.